So last night LeBron James went nuts in Game 6 of the Eastern Conference Finals. 45 points, 15 rebounds, 5 assists. A stat line for the ages. A thing of legends. Doesn’t matter though, I still hate his guts. But I’ll give him his proppers, he straight killed it last night. I still don’t think that as a team, the Heat are as good as the sum of their parts. What I’m saying is individually they have the talent, but together they haven’t really figured it out. Yeh, Bron Bron went off last night, but where was the clutchness from his buddy D-Wade? Wasn’t really there, check the stats. I’m gonna give ya a comparison of 2 rosters and then explain myself. Roster 1: LeBron James, Dwyane Wade, Chris Bosh, Shane Battier, Mario Chalmers, Udonis Haslem, Mike Miller, Norris Cole, Ronny Turiaf, Joel Anthony, James Jones (I’ll stop there because nobody else is getting any run in the games. Obviously Roster 1 is this years Miami Heat. 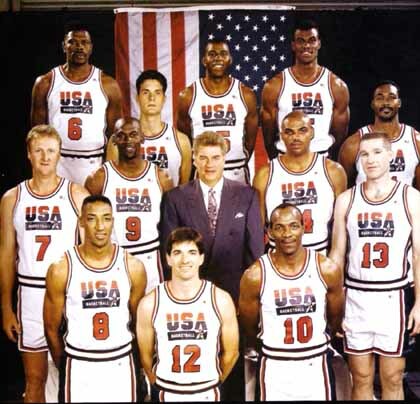 Roster 2 is Team USA from the 2006 FIBA World Championships. Which of these teams would you say is better? Without question Roster 2. So what’s my point? Well Team USA in 2006 finished FOURTH in the FIBA World Championships. That’s right 4th! As individuals, look at the other rosters for the teams they played against and maybe, MAYBE Spain was close, but they still should have never lost. Again what’s my point? That individuals don’t win championships, TEAMS do. In 2004 Olympics, Wade and James on the same team as stars like Tim Duncan and Allen Iverson, yet they lost in the Olympics. They lost in 2006. They won in 2008, but no because of Wade or LeBron (and definitely not because of Bosh who was also on the 2008 team). They won in 2008 because they had a guy name Kobe who in the last game, when these “stars” got scared to take over, went into “F%^$ everybody” mode and single handedly won Team USA the Gold Medal. Throw in last years choke job by the Heat in the Finals, and collectively the Big 3 of Wade, James, and Bosh are 1-2 in tournaments together (with that 1 being a product of Melo carrying them in the knockout rounds and again Kobe being Kobe). If you collectively figure Wade and James records together its 1-3 in tournaments. Think about that. Now think about why. It’s because they aren’t complimentary players. They aren’t Jordan and Pippen. They are player 1-A and player 1-B. They are the same style player, just in different sizes (Derrick Rose is player 1-C, just like them but smaller). They play the exact same way. Neither has a reliable outside jumper (last night was an outlier), and both like to slash and have the ball in their hands. They would rather dribble the clock out and do their own thing. That’s the way they play. For some reason people don’t see it. But look at them closely. Yes Bosh helps them spread the floor, but he needs the ball in his hands too, and last I checked there is only one ball on the court at a time. Maybe that’s what he meant, that they wouldn’t win any?? “Once the game starts it’s gonna be easy.” How easy is it now Bron Bron? Yes. We. Did. What exactly did you do? Keep in mind this was the “Celebration” for winning their first title. Wait, what? They haven’t won anything yet? Oh, then what the hell was this for? Oh, it’s because they all signed contracts? Wow…..